News: One World Trade Center in New York has become the world's third-tallest building after topping out at a height of 541 metres. A 124-metre steel spire was installed last Friday, pushing the skyscraper's height to 1776 feet – a number commemorating the year of America's independence. One World Trade Center is now the tallest structure in the USA and the third-tallest in the world, although there is debate over whether the spire is actually a removable antenna – a vital distinction in measuring buildings. Built at a cost of $3.9 billion, the tower also has the distinction of being the most expensive office building in the world. Previously known as the Freedom Tower, the building is located in the northwest corner of the site where the former World Trade Center towers were destroyed in the 11 September 2001 attacks. 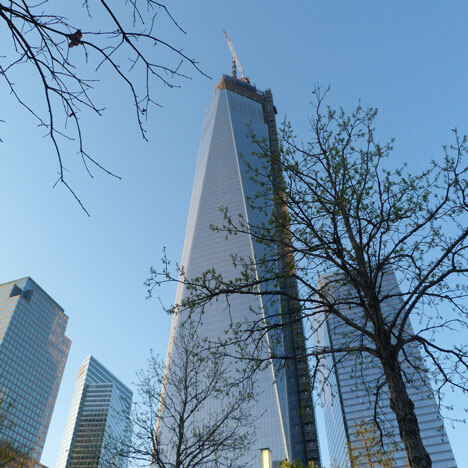 Originally designed by Daniel Libeskind – the architect behind the masterplan for the entire Ground Zero site – the tower underwent numerous revisions before US firm SOM was brought in to oversee its design. When finally completed it will offer 241,000 square metres of commercial office space as well as observation decks, TV broadcasting facilities and restaurants. Another building on the site, Four World Trade Center, topped out last summer, while Ground Zero is also home to two fountains sunk into the site of the former Twin Towers – see all architecture in New York. SOM recently unveiled plans to build Singapore's tallest tower, while last year the firm proposed adding a floating observation deck over New York's Grand Central Terminal – see all architecture by SOM or see all skyscrapers.